The Langham Hotel Melbourne boasts timeless poise and elegance, and is one of the finest five star luxury hotels in Melbourne. It apparently has been voted the top city hotel in the South Pacific. It is renowned for its old fashioned hospitality, European elegance and sophisticated service. 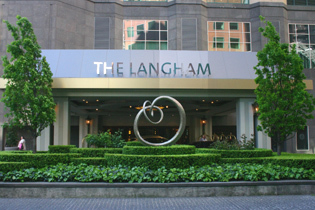 The Langham Melbourne is located on the south side of the Yarra - not the city side. It is more quiet and peaceful there - a great location for visiting the National Galleries, Federation Square, The Arts Centre, the Melbourne Exhibition Centre and the Crown casino. From the hotels Riverview rooms you get superb views of the Melbourne skyline and the Yarra. For secure bookings and best prices, you can book the Langham Melbourne here - No Reservation Fees! The Hotel has a rooftop pool from which you can admire Flinders Street Station and the Melbourne city across the Yarra. It also has a great restaurant, bar, and a luxurious health spa and health club. There is a ballroom for special events and great business facilities. The Langham Hotel Melbourne is an ideal place if you dont want to be right in the hustle of the city. From there, you can take a relaxing stroll along the Southgate promenade or visit its boutiques, al fresco bars and restaurants. The city is only a short walk away via the Sandridge footbridge, which takes you to the centre of Melbourne. Really, the best of both worlds! There are trams along the nearby St Kilda Rd, which connect you into Melbournes tram network that can take you pretty much anywhere. Prices for Melbourne Australia Hotels vary according to the season and Melbourne events. Discounted prices, way below hotel rack rates (standard rates), are available over the internet. You can make a booking for good deals and last minute Melbourne hotels here.